The art of Şakir Gökçebağ plays with one’s perception of normality and challenges any prior convention or knowledge of how things were designed to function and how they exist in the order and logic of the everyday man-made world. 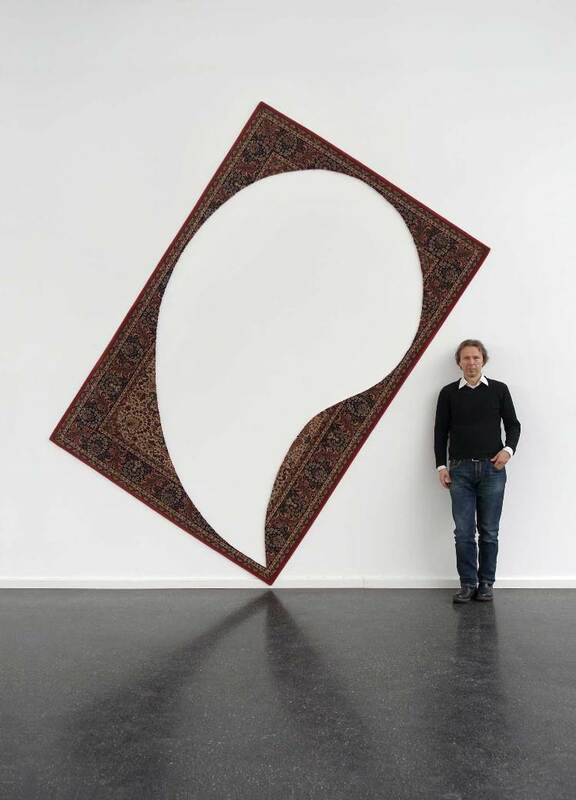 There are no should be’s in the work of the Hamburg-based Turkish artist, who offers an alternative to the absurdity of our own banality, a disruptive and humorous perspective of what we may have thought lacks any other meaning besides that given by our own eyes, rules and symbols. An unbiased look at reality based on simplicity, on the free and multiple possibilities of is. 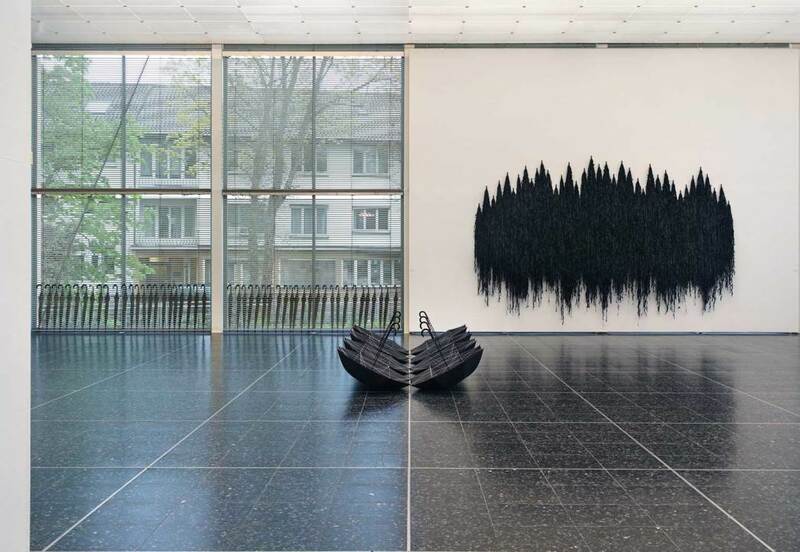 Moreover, the artistic interventions comprise a limited number of objects that can be easily recognizable by anyone – carpets, umbrellas, plastic buckets – yet with endless creative permutations. Through isolation or, on the contrary, insertion into groups of identical objects, through cut-out, distortion, precise arrangement or switch of position, objects with once familiar purposes unexpectedly become part of new contexts, substitutes or carriers of different connotations from their initial ones. 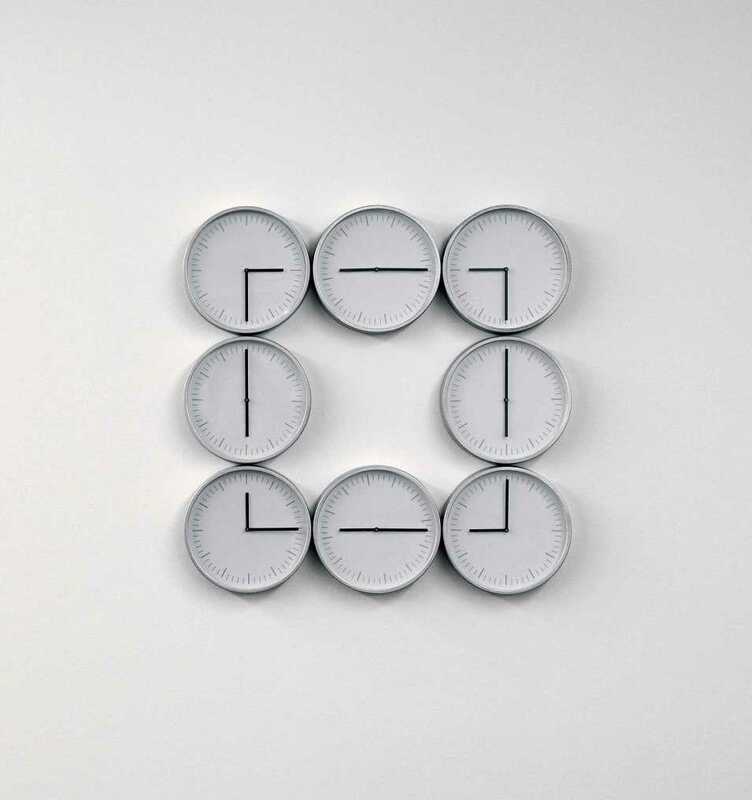 Contrasts seem to interest the artist who in Times Square opposes the passing of time to the stillness of the clock hands, as well as the circle form of the clock to the perfect square the lines create. In Blah Blah, words are incomprehensible – the case of an unknown language, suggesting an inability or refusal to understand the other/consider another idea/view, reduced to the ironic blah blah, which also links to ignorance and ridicule – or perhaps it reveals the non-sense of discourse. 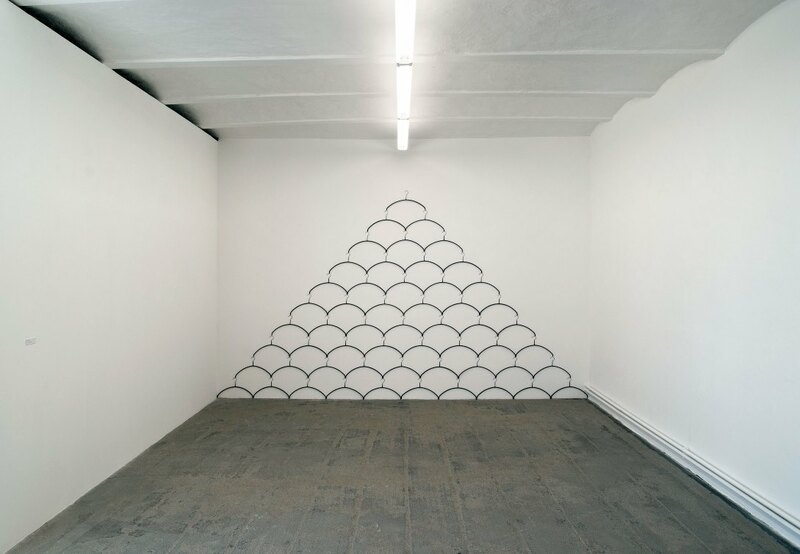 And in Reorientation 09, it is no longer the ornament but the absence of material that generates meaning. 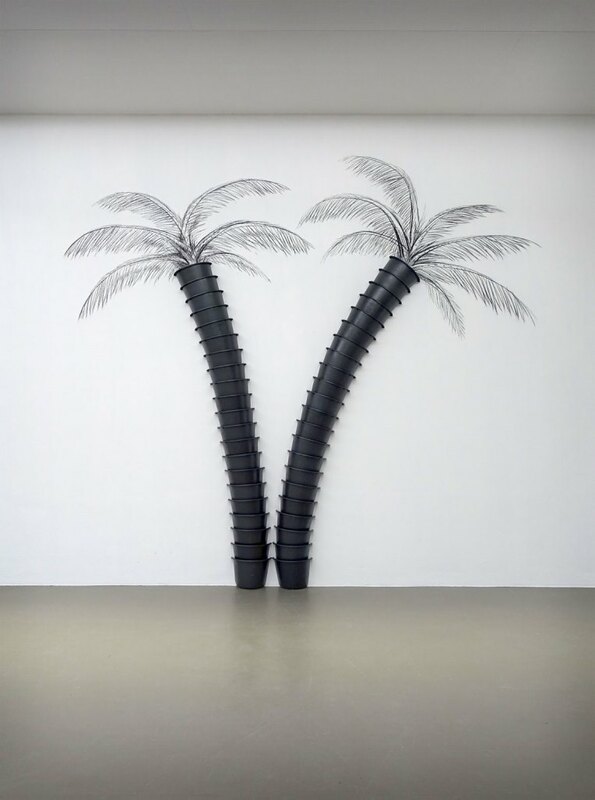 In the context of man evolving outside the natural environment, depending nowadays more than ever on technology and fabricated, serial, ready to be used objects, meant to provide comfort and ease our lives, several installations imagine a transition to organic forms in a non-functional, poetic approach – clothes hangers form a hill, black buckets ‘grow’ as trunks of palm trees on the white gallery wall. 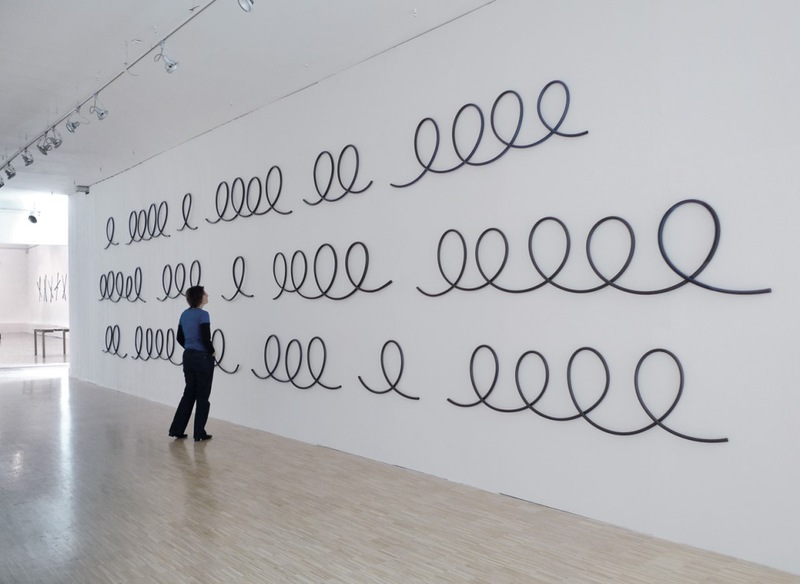 Simple yet profound, a result of both spontaneity and discipline, rooted in reality but escaping its fixed rules, the work of Şakir Gökçebağ is playful and thought-provoking, an invitation to question routine and see beyond the ordinary. More info about the artist his website, on Facebook and Instagram.